One of the most challenging aspects of hardscape design is the proper placement and sizing of outdoor patios. Good patio design gives you the opportunity to create an outside living area - an extension of your home - for entertaining and relaxing all year round. To know which patio type will best suit your needs, you must determine how it will be most used, and how much space you have to work with. In large backyards, an open outdoor living room space may be ideal. If you have a quaint courtyard or side yard area, a bistro patio with a vertical wall fountain might be your best bet. Below are links to the most common dimensions for good patio size. You can also print the patio size chart (PDF) for reference. A little bit of homework is required when deciding on a patio layout. Before your patio is poured, you need to think through exactly how you plan to use it. Do you like to entertain? Then you might think about creating various large patio areas to accommodate dining areas. Or is your backyard your private sanctuary? Then you might prefer bistro-size outdoor rooms with various small, cozy destination areas throughout your yard. If you have young children, designating play areas may be part of your plan. The options may be endless, but the theory is the same that "form follows function". 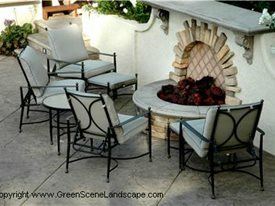 In essence, determine what it is you like to do and let your patio design come about from that thought process. How many people do you entertain on a regular basis? Do you also have large parties? How many people do you typically need to accommodate at these parties? What are your favorite patio finishes? Stamped concrete? Pavers? Brick or stone? What style, size and quantity of patio furniture will you be using in the yard? Armed with the answers to these basic questions you can lay out patio space appropriately. Standard size 6-7 feet. Great for side yards and little back corner destinations. Make the patio large enough to accommodate a small table and at least two chairs. A good size for a bistro patio is about 6 to 7 feet in diameter. When it comes to stamp pattern choices, smaller is usually better. Consider using cobblestone or brick versus large field stone or slate patterns. Large patterns will overwhelm the space and it will be difficult to establish pattern continuity in such a small area. Another option is to use an embossing or texture skin over the entire patio for a more subtle look. 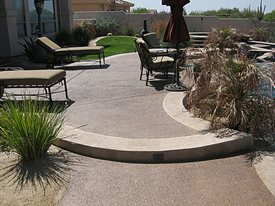 For examples, see Stamped Concrete Patterns and Designs. Because bistro patios are usually adjacent to the home, it’s best to keep the colors simple and choose tones that complement the façade of the house. Standard size 16-18 feet. Great for deep seating patio furniture. To accommodate your guests, be sure to provide ample room for traffic flow. A good rule of thumb is to allow a 3-foot clearance around furniture. For more intimacy, your outdoor living area should have a central conversation area designed around a focal point, such as a fireplace or fire pit. To shelter your living room patio from harsh sunlight and rain, consider installing a pergola supported by decorative concrete columns or a gazebo. See this project: Stamped Concrete Patio and Pergola Transform a Backyard. Use concrete or masonry seat walls to create zones for different activities and to provide decorative interest. Standard size 12-14 feet. Great for accommodating a 48" round table. A 48" round table can seat 6-8 people depending on the size of the chairs. The minimum patio size to accommodate a 48" round table is 10 feet 6 inches. This allows enough space to pull out chairs, but not much walk around space. 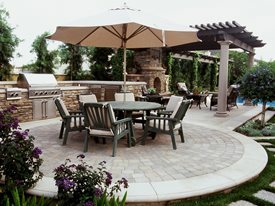 Use 12-14 feet as a minimum patio size allotment for each 48" round table you intend to accommodate. Size your patio based on your entertaining needs and the number of people you plan to host regularly. 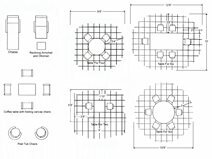 View this patio sizing chart for standard round and rectangular spacing. Standard size 2-6 feet. Great for lounge chairs and cocktail tables. If you want to include a sundeck for lounge chairs then plan a space that will accommodate 2-4 lounge chairs (2ft x 6ft) with cocktail tables between and a 3 foot clear walking space past the foot of the chairs. Around swimming pools you may want to increase your minimum clearance from 3 feet to 5 feet to avoid an accidental dip in the pool.